was recently promoted to the rank of Professor at the May 4 Board of Trustees meeting. 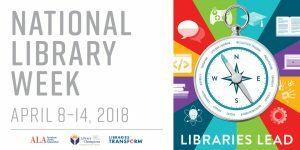 This week, University Libraries joins libraries in schools, campuses, and communities nationwide in celebrating National Library Week, a time to highlight the changing role of libraries, librarians and library workers. Poetry Reading – Bring a copy of your favorite poem to recite or look through some of our poetry books from the Center for Archival Collections’ poetry collection to find inspiration. You do not have to recite a poem to attend. We will also have our collection of artists’ books on display. Dunkin Donuts! – The Friends of the University Libraries will serve Dunkin Donuts and coffee to our patrons. The Browne Popular Culture Library at BGSU will host an academic conference focused on various aspects of the romance genre. The “Researching the Romance” conference will be held in two locations over the course of the weekend. Friday’s sessions will be held in the Jerome Library on the campus of Bowling Green State University, while Saturday’s events will be held at the Wood County District Public Library in downtown Bowling Green. Prize Patrol – Staff from the Curriculum Resource Center will be patrolling the library with book related questions and fabulous prizes. You could win a fabulous prize! Each year, The Friends of the University Libraries recognizes members of the University community for their scholarly publications and artistic achievements. This year, honorees will be selected for accomplishments that occurred from January 1, 2017 to December 31, 2017. We will honor them at a Reception on April 11, 2018. We are asking you to nominate individual(s) from within your department or area by completing the nomination form, which is available on the Friends web page. Self-nominations are acceptable. To ensure that all nominations receive full consideration, nominations must be received no later than 5 p.m. Friday, March 2. Thank you for participating with The Friends in this important project.